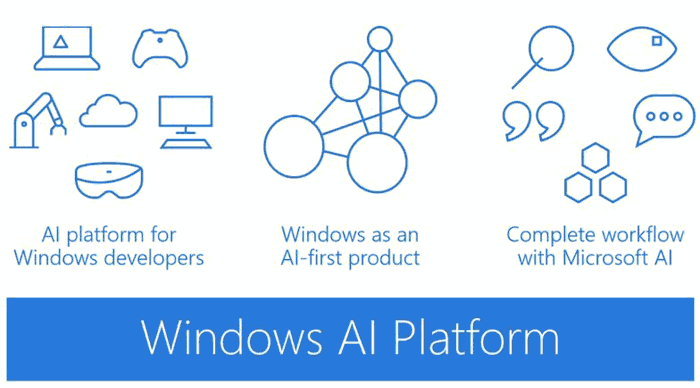 Microsoft held a Windows Developer Day yesterday and announced Windows ML. As computing industry watchers will probably guess 'ML' stands for 'machine learning'. 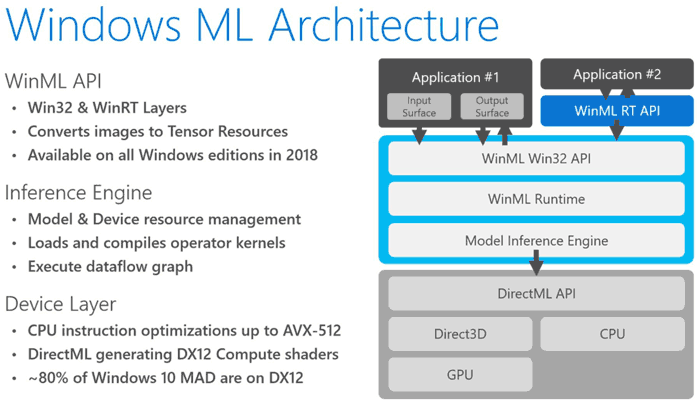 Intel succinctly explains that Windows ML "enables developers to perform machine learning tasks in the Windows OS" and would like to suggest that its Movidius Myriad X VPUs (Vision Processing Units) are a good choice for accelerating such tasks. 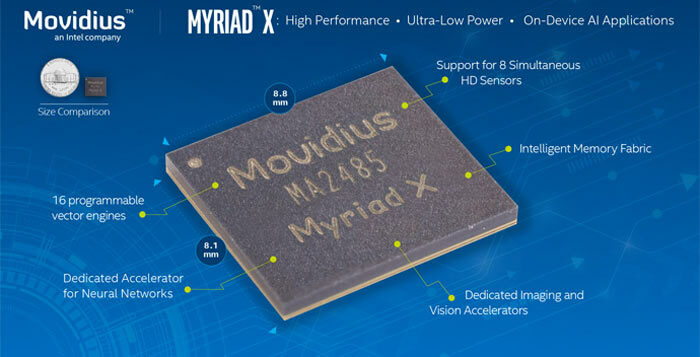 The Movidius is a purpose-built third generation chip for accelerating AI workloads at the edge which can work to run AI tasks from burdening other hardware. We have seen a trend among smart mobile device makers in adding AI smarts to Android, to try and win customer hearts and market share. The designers employ AI to make their smartphones smarter and hopefully more attractive. With AI features, and dedicated AI coprocessors like those built into the Huawei Mate 10 or Samsung Galaxy S9 (with Bixby), your smartphone can offer better assistance through real-time language services / translation, improved battery management, and a multitude of AI-enhanced imaging, object tracking and recognition algorithms. In Windows, powered by Intel VPUs where available, AI will be used to enable more intelligent client applications and core OS features, such as personal assistants, enhanced biometric security, smart music, and photo search and recognition. Microsoft gives examples of current AI capabilities available to all Windows 10 users; we have access to Cortana, Bing Search, and Office 365 with AI capabilities. A more specific example of a recent development is creating videos and searching through massive photo collections in the latest Photos App. These kinds of advances will become all the more common in the next major update to Windows 10. Thanks to Windows ML, third party developers will be able to use AI to build more powerful and engaging experiences, like Microsoft's. With local processing and AI accelerators such tasks will be faster, or even real-time. Windows supports ONNX, an industry standard format for ML models backed by Microsoft, Facebook, and Amazon Web Services (AWS). Furthermore, starting with Visual Studio Preview 15.7, adding an ONNX file to a UWP project will automatically generate a model interfaces in your project. While Intel's blog paints itself and Microsoft as a natural partnership on PCs, it does have plenty of competition. Microsoft's Windows ML and AI blog post from yesterday mentions that Redmond is working closely not just with Intel, but with Qualcomm (using the Snapdragon 835 AI Engine), and AMD and its powerful CPUs and GPUs. Let us not forget that earlier this week Arm announced accelerated ML / AI operations would be delivered by its Mali-G52 GPU too. Further Windows ML and AI technology will be revealed and discussed at Build 2018 from 7-9th May. ML and AI is a headline topic at this upcoming developer conference. Right… let me just buy a GAMING case. I am actually surprised that we haven't yet seen a mainstream retail case with automated features and cortana or alexis built in, I have seen custom builds using this idea but nothing for the general consumer and nothing that actually controls parts of the case - “Alexis! pop out one of the drive bays for me I need to switch a hdd, Alexis! all done, pop the drive bay back in and then tell me what the football scores are!”.